Schroll (CP) - Upgraded from CoPilot to Pilot on 14 March 1945 Mission #336. 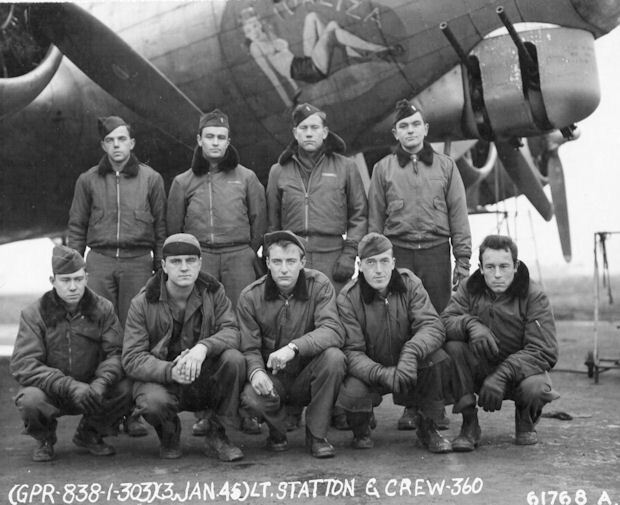 Statton Crew then flew with various other CoPilots on their remaining 12 missions. Maxson (WG/TG) - Flew 17 missions as Waist Gunner and then became Tail Gunner on 25 February 1945 when crew size was reduced from 9 to 8 men. Mission #300 10 January 1945 in B-17G #42-97861 Iza Vailable III (360BS) PU-C. Nose of Iza Vailable III suddenly went up while flying at 26,700 feet. Lt Statton (P) and Lt Schroll (CP) jointly exerted control pressure to bring the nose down. They believed that they had been hit by flak. The autopilot was used to control the aircraft which had dropped to 25,000 feet. Sgt Maxson (WG) reported that the tail gun position had been knocked off the B-17 and that Sgt Mooney (TG) was missing. He had been wearing his parachute but was killed when his tail compartment was destroyed. The accident and weather forced Lt Statton to drop behind the formation and make an emergency landing at Airfield B-53 at Merville, France. It was later determined that Iza Vailable III had been hit by B-17G #42-39875 Buzz Blonde (427BS) GN-F just after "bombs away" after the CoPilot of Buzz Blonde, Lt Alderman, applied full power to stay in formation. Pilot 1Lt Grafton N. Smith made a wheels up landing in his damaged B-17 at Field A-97 in Sandweiler, Luxembourg. Lt's Statton and Schroll were awarded the Distinguished Flying Cross Medal for their skill in controlling and landing their damaged B-17. The eight surviving crewmen returned to Molesworth.